save €20.00 when complete today! Order the James Connolly medal today – save €20.00! Start today by ordering the James Connolly commemorative medal, depicting a portrait of James Connolly, an Irish republican and socialist leader, featured with the Plough and the Stars. Normally €49.95, the layered in pure silver can be yours today for only €29.95 with a total saving of €20.00. Demand to complete the Seven Signatories medal sets is very high as complete sets are always more valuable to collectors. However, the low edition limits means less than 1% of Irish citizens will be successful in securing the complete set. An immediate order is imperative for the best chance of securing your set and your €20.00 saving. Each of the six remaining medals in the set have the same low edition limit of only 30,000 worldwide and are layered in pure silver. Each of the medals depicts the portrait of one of the Seven Signatories, together with their name and a fitting individual inscription. 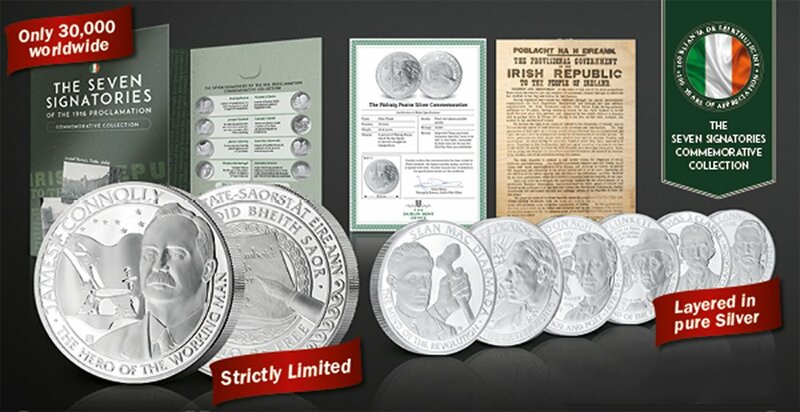 The commemoratives all share a common reverse design inspired by ‘Amhrán na bhFiann’ (‘A Soldier’s Song’), which was first coined during the Easter Rising and adopted as the national anthem of the Irish Free State in 1926.